The scientific basis whereby an early version of ShellSIM replicated dynamic adjustments in feeding, metabolism and growth within individual larvae or seed during different temporal and spatial scenarios of culture to harvestable size was originally reported by Hawkins et al. (2002). Since then, a common set of functional physiological interdependencies have been confirmed and refined using standardized procedures over a broad range of species and sites (illustrated below) (Hawkins et al., 2012, 2013a, 2013c). This common set of relations may now be calibrated within ShellSIM for different species, when growth (illustrated below) and its component physiological processes are successfully simulated across full natural ranges of temporal and spatial variability in natural environments that range from open water to turbid estuaries. The robustness of ShellSIM’s common structure is confirmed by successful calibration and validation in 14 species to date, simulating to <25% error even when applying a single standard set of parameters to predict individual growth in the same species across contrasting environments and culture practices, as has been shown in M. edulis and C. gigas and C. virginica to date (summarized in Table below). 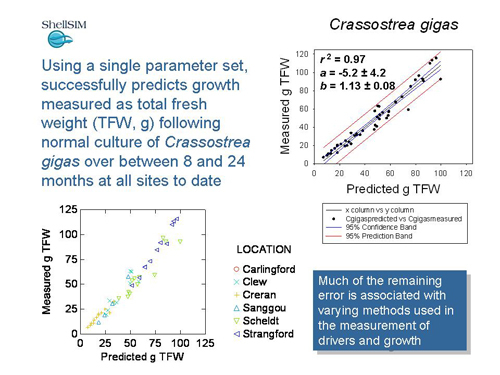 To further establish ShellSIM’s credibility, we have undertaken analyses of goodness of fit based upon comparisons between simulated and observed growth of individual shellfish using linear regression as described by Portilla and Tett (ECASA Internal Paper, 2007). 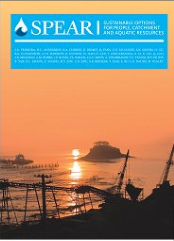 Trans-site analysis of all measured and predicted data, using a single standard set of ShellSIM parameters, for C. gigas during normal culture in the Sanggou Bay (China), Oosterscheldt (Netherlands), Strangford Lough (Northern Ireland), Carlingford Lough (Northern Ireland), Clew Bay (Republic of Ireland) and Loch Creran (Scotland) indicated that the slope and intercept of fitted regression were both different from zero (p < 0.05), and that the slope is significantly different from 1 (p < 0.05) (illustrated below). 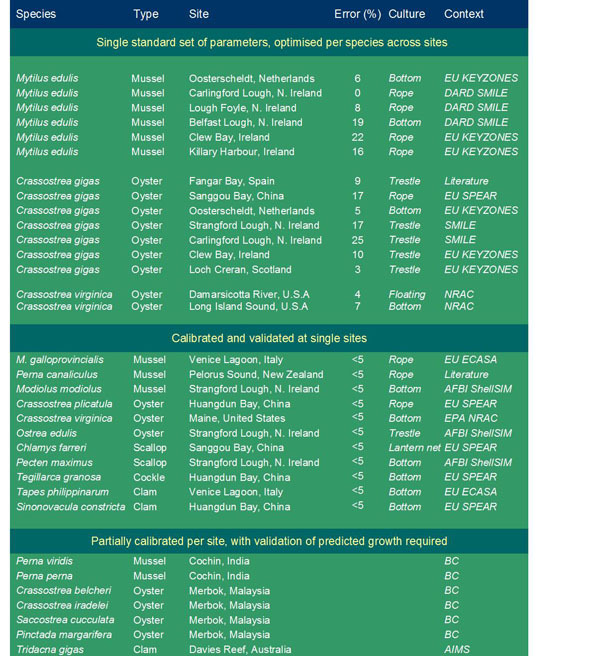 Similarly, trans-site analysis of all measured and predicted data, using a single standard set of ShellSIM parameters, for M. edulis during normal culture in the Oosterscheldt (Netherlands), Strangford Lough (Northern Ireland), Carlingford Lough (Northern Ireland), Lough Foyle (Northern Ireland), Belfast Lough (Northern Ireland) and Clew Bay (Republic of Ireland) indicated that the slope and intercept of fitted regression were both different from zero (p < 0.05), and that the slope is significantly different from 1 (p < 0.05). On which basis, according to Oreskes et al. (1994), ShellSIM’s generic performance when applying a single standard set of parameters to predict growth across a broad range of culture environments and practices throughout Europe and Asia is classified as “good” to “excellent” in both C. gigas and M. edulis (Hawkins et al., 2013a). Compared with the many models that have been optimised in a single location or system, this a significant step forward, not only in the face of contrasting environments, but also of different genetic background (i.e. 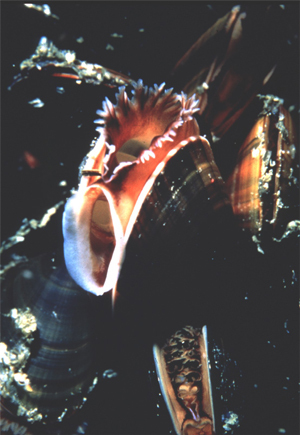 shellfish stocks) and culture methods that vary between locations. 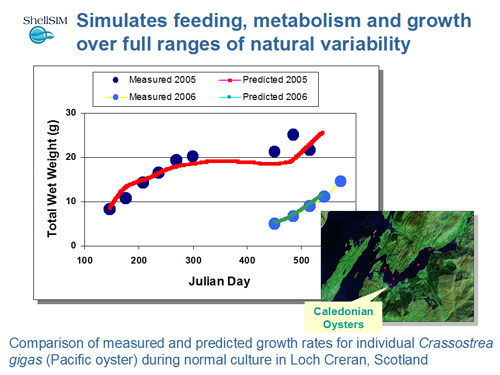 Ability to up-scale from the individual to the population, taking density-dependent effects into account, has been validated on numerous occasions through effective simulations of farm- and/or system-scale production using principles that are now afforded within ShellSIM; those analyses helping to optimise culture practise and simulate interrelations between shellfish and key ecosystem properties and/or processes when cultured under different scenarios at sites in America, Europe and Asia (Bacher et al., 2003; Duarte et al., 2003; Nunes et al., 2003, 2011; Ferreira et al., 2005, 2006, 2007a, 2007b, 2008a, 2008b, 2009; Hawkins et al., 2007; Gubbins et al., 2008; Sequiera et al., 2008; Nobre et al., 2010; Newell et al., 2012a, 2012b, 2013a, 2013b, 2013c, 2013d). 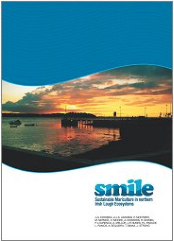 As examples of such up-scaling, when ShellSIM has been integrated within collaborative tools for practical use by aquaculture farmers, environmental managers and regulators, Project booklets are available by clicking on the thumbnails below.